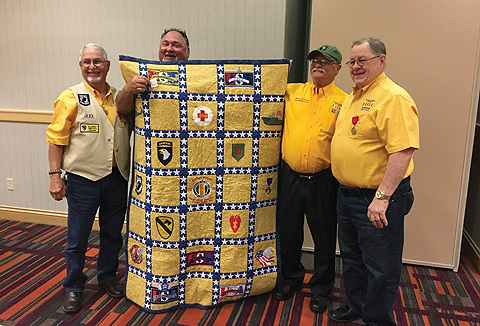 If you attended VVA’s National Convention in New Orleans last year, you probably saw Kaye Lessard’s quilt on display at the Louisiana State Council booth. It’s the third one she’s worked on to support veterans. The first, a collaboration of veterans’ wives, raised $3,000 for VVA. The second, in support of Gulf War veterans, also raised $3,000. Kaye and her husband, Mallory Lessard, donated this most recent machine-embroidered quilt to the Louisiana State Council, which has invested a lot of effort in helping those affected by last year’s hurricanes. The Lessards hope the quilt’s raffle proceeds will be used to fund more relief efforts for veterans. The raffle drawing was held February 25 during the Louisiana SC’s Mid-Winter Conference. Alexander M. Winkowski, the secretary-treasurer of Cecil County, Maryland, Chapter 722 was the winner. The other winner was the Louisiana State Council, which took in $1,500 in raffle ticket sales.